A recent study of 2,000 consumers revealed that Generation Y shoppers are twice as likely as the Baby Boomer generation to share their retail experience, according to global PR company Brodeur Partners. The ability to share shopping experiences highlights the importance of social media to consumers. It’s abundantly clear that retail companies need to use social media to satisfy customer demand. 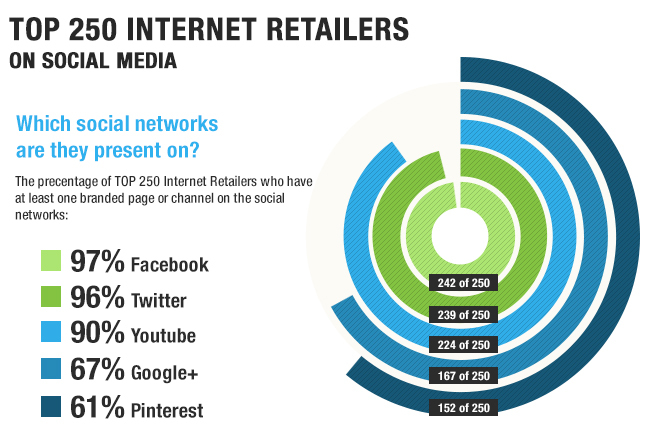 In the Infographic below, Campalyst social media software broke down the social media presence of the top 250 internet retailers. The results demonstrate that in this day and age it’s nearly impossible to be a top retailer without the use of social media. Why is Social Media Vital to Retail? 3.3 billion brand mentions every day in the United States on social media sites. 2.2 billion conversations related to brands every day in the United States on social media sites. A typical American mentions a brand in online and offline conversations 60 times a week. 54 percent of customers use word-of-mouth communication to influence their purchasing decisions. If you want keep customers happy and to have an edge on competitors, then you must integrate social media into your entire business model. This allows your retail business to build exposure and create hype through your customer base. Digital Marketing Sapiens can help you create specific business-oriented goals, brainstorm creative methods to reach your goals, and then help you orchestrate a smart social media campaign!